The Detroit News is not to be outdone. Check out some of there stuff too. Great pictures along the top showing images of the current Tiger fever epidemic as well as pictures form the 84' and 68' Tigers. Great stuff. 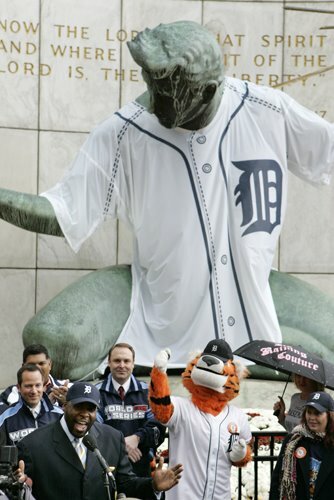 Detroit has a great Statue downtown of the "Spirit of Detroit" It has worn the Redwings jersey and the Pistons, now we have a Tiger jersey to go along with the others. This entry was posted on October 20, 2006 at 9:31 PM. You can skip to the end and leave a response.